2. 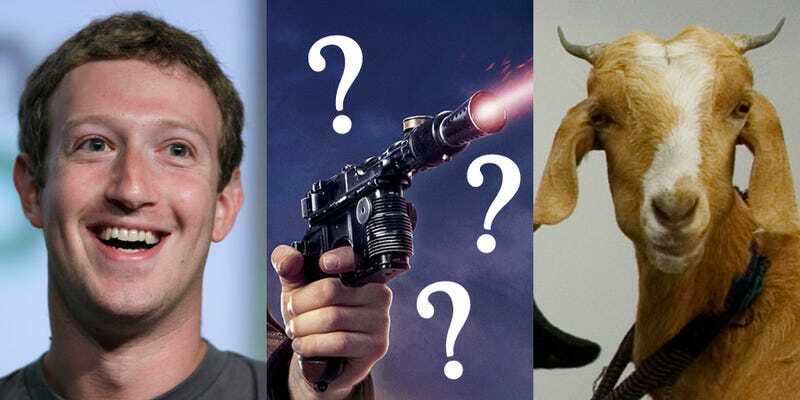 Dorsey was mistaken twice, and what he described as “a stun gun” was, in fact, a captive bolt pistol Zuckerberg used to kill the goat. These devices stun animals by shooting a retractible rod into their skulls and entered popular culture as the weapon of choice of Anton Chigurh, the antagonist of Cormac McCarthy’s No Country for Old Men and the film adaptation of the same name. 3. Dorsey accidentally told the truth the first time, and Mark Zuckerberg really does have some kind of secret Terminator gun he used to zap that poor goat to the big garbage dump in the sky. Realizing his error, Dorsey then made up the whole “stun gun” thing. If you know anything about Mark Zuckerberg’s “laser gun” or have your own theories about the nature of the device, please email us at knifedog@gizmodo.com.